Copyright 2014 The Authors- this article is distributed under the terms of the Creative Commons Attribution 3.0 Unported License. (CC BY 3.0). Many species of birds are adversely affected by clearcutting of Australian eucalypt forests for timber. However, recolonisation of harvested areas may be enhanced if mature forest is retained nearby (forest influence). We test the benefits of proximity to mature Tasmanian wet eucalypt forest on birds in adjacent regenerating clearcuts. We hypothesised that bird assemblages in silvicultural regeneration would become more similar to those in adjacent mature forest with increasing proximity to the mature forest. To test this, we sampled birds in regenerating clearcuts using 25 m radius point counts centred 35, 120, and 200 m from mature forest. 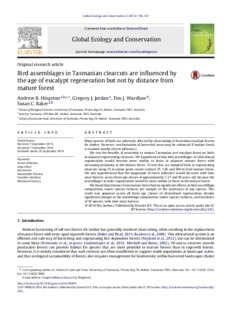 We also hypothesised that the magnitude of forest influence would decrease with time since harvest, across three age classes of approximately 7, 27 and 45 years-old, because the assemblages in older regeneration would be more similar to those in the mature forest. We found that distance from mature forest had no significant effects on bird assemblage composition, native species richness per sample, or the incidences of any species. This result was apparent across all three age classes of silvicultural regeneration, despite significant changes in the assemblage composition, native species richness, and incidence of 10 species, with time since harvest.